We invite you to escape to Tranquility, Nature and Relaxation. This cozy log cabin is situated on a cul-de-sac surrounded by Georgia Pine trees giving you the feeling of complete privacy, but only minutes from state parks, historic sites, golf courses, Lake Richard B. Russell and Lake Hartwell. The cabin is available for nightly (2 night min. ), weekly or monthly rental. Lake Russell (26,500 acres) touts 'world class bass' fishing; a new 7000 yard fully sodded golf course, Arrowhead Pointe, is only one mile away at R. B. Russell State Park. Nearby communities offer history and convenience in a small town atmosphere, with everything from antiques and marine supplies to fine dining, coffee shops and live bluegrass music at The Depot in Hartwell. We are an easy drive from Atlanta, Athens, Augusta and Greenville, South Carolina. The floors are rustic top-nailed white pine with ceramic tile in the two master bathrooms and utility room. The kitchen is fully furnished with top of the line appliances (glass top stove, microwave, double door refrigerator with icemaker and dishwasher). Plan your 'Great Escape' - call or email us for reservations today! 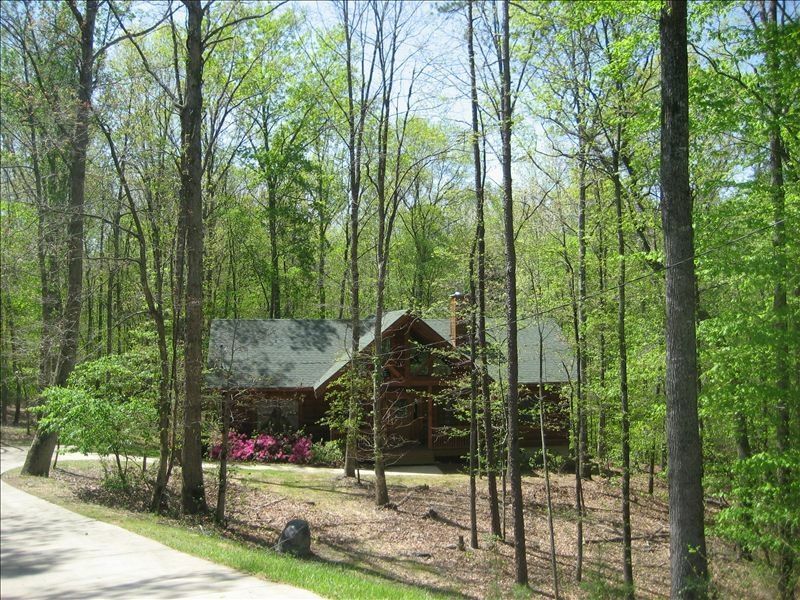 Hardwoods, privacy, tranquil setting overlooking spring fed creek. Abundance of wildlife to observe. We are located one mile from the Lake Richard B Russell State Park entrance. From the time we walked in the door and admired the beauty of the cabin until our very last minute, we thoroughly enjoyed our stay. The four of us wanted peace, tranquility and relaxation which is exactly what Deer Run delivered. My friend and I took special pleasure in bird-watching while our husbands took full advantage of the Arrowhead Point golf course. We stayed for a month and hope to return in the future for even longer. The owner's response time to our one inquiry was speedy and immediately rectified (nothing serious for us, just a concern). Thanks for providing us with an incredible experience! Gabi is great to work with on all the details of the reservation. Very timely return of the security deposit. The cabin is very comfortable, and has everything you need for a relaxing visit away from the noise. Very quiet wooded location. Will definitely visit again! The property is perfect for an escape from the busy, every day hustle of pretty much anywhere. I, along with a small group of close friends, thoroughly enjoyed our weekend here. This was their first trip to the area and they absolutely loved it. So much so, that we are already hoping to make this an annual trip and our destination for each year. The location is beautiful, secluded, private, and exactly what you would want in a cabin tucked away in the northeast Georgia woods. The cabin was clean, had everything that we needed, and comfortable. Due to its seclusion, make sure to bring whatever you need for meals, etc., with you because the nearest town is about 10 miles away (which was part of the draw for us). Cell service is spotty at best (very common in that area of the county) but the wifi allows for sending messages or making calls if needed. If you are looking for a quiet get-away, a romantic weekend, or just a spot to enjoy nature and its beauty, this is the place for you! Nearby golf and fishing also provides for some fine activities. The course is pretty solid and tough enough to challenge any player, while still being fun even for beginners. Lake Russell has some of the best fishing in the area and remains untouched by development (a Corps of Engineers lake, so no houses or docks). We love this cabin! Our 4th getaway here- clean, comfortable and full of peace and quiet! Looking forward to our next trip! Great location, lots of privacy, Gabi is great to work with. Will definitely stay here again. Nightly Rates do not include taxes and other fees. Reservation/Security Deposit of $200 is due at time of reservation; it is fully refundable within 14 days of vacating, pending no damage. Rent is due 30 days prior to arrival. We accept personal checks, Visa, Master Card and Discover Card.